Worlds Beyond - What happens AFTER we die? This book offers more GROUND BREAKING, AUTHENTIC KNOWLEDGE merging the boundaries of Science with Spirituality- yet free from religious or dogmatic principles. These teachings expand on the hidden Truths revealed in Truths, Lies & Distortions. Advanced Masters– from refined Mind levels BEYOND the ‘Spirit World’ vibrations–engineered the dictation of these mind-blowing revelations, in a jargon-free conversational style, through the respected clairaudient medium Brigitte Rix, who channelled their knowledge by writing down their words in high speed ‘automatic writing’. They wish to help Mankind free itself from man-made, distorted theories and ignorance-breeding disinformation. So, they are SPEARHEADING a new and more logical UNDERSTANDING of WHO YOU ARE and THE CREATION of our and other Universes— as many open-minded cosmologists see a ‘big bang’ as a flawed theory. Our Universe, Earth, planets etc: designed experiments, not accidents! No ’void’: Pulsating Creative Energy striving to actualize its urges. Astounding development from ‘Energy shoots’ to conscious Beings. You existed BEFORE you were born as a Human. Bodies: ‘disguises’ for Beings of Mind Energy to manipulate Matter. Nobody chooses to be born a ‘murderer’. Roles of ‘Higher Self’ and ‘Spirit Guide’. ‘Spirit World’: vibration level as an ‘airport’ between Earth lives! What happens to any Consciousness when the flesh ‘dies’. Development & degrees of Consciousness…even in Plants & atoms! Intelligent Superior Beings of Energy BEYOND the ‘Spirit World’. Physicality in other planets? Other dimensions of invisible existence? Stonehenge: Power house from ley lines. Insights into unknown and invisible Power stores within Space. Secrets of Creation: Intensity, Focus and controlled progression! How YOU can improve your life and help others. 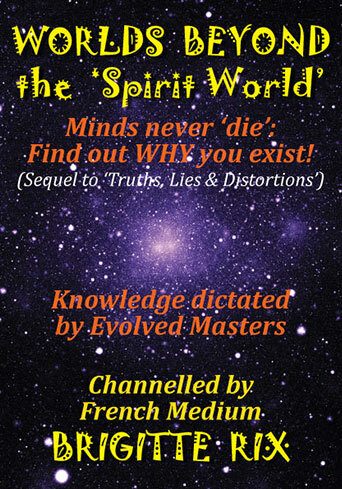 “This enlightening book shows how the mind can be expanded to receive knowledge from beyond the World of Spirit. I find parallels here with the Electric Universe theories and Quantum Mechanics. As always the truth is stranger and more wonderful than fiction”.